This is my blog website. I hope this is a place where my family, friends and supporters can go to read about my daily life experiences and adventures as I’m serving on the mission field here in Romania. I am so grateful for all of your prayers, encouragement and support as follow after the call of God on my life here in Romania and to other nations as well. Minnie! Some of my hobbies are: reading, blogging, traveling and listening to music. I also enjoy spending time with my friends and learning the Romanian language. I like any kind of food but especially Italian food. Strawberries are my all time favorite fruit. Two of my top two favorite TV shows are: Amazing Race and America’s Got Talent. Some of my favorite Christian music bands are: Jesus Culture, United Pursuit, Casting Crowns, and Chris Tomlin. My birthday is on October 15th. If I were to pick one word to describe myself I was say “blessed”! My very first short-term missions experience was in the summer of 1999. I came to Romania for 5 weeks where I worked in an orphanage in Buftea and with abandoned babies in a hospital in Bucharest. That trip totally changed and transformed my life! From that moment on in my life God set me on a course of a journey that led me to where I am today. God gave me a deep burning desire to reach out to the needy and hurting children in Romania especially the orphan children. That summer I was in the middle of my two-year diploma program at Durham College (Oshawa, ON) where I was studying for my Early Childhood Education. After my graduation it was still very much on my heart to return to Romania and work with the children there. I asked for God for direction for the next step. God then led me to go to Tyndale College (Toronto, ON) to study for my TESOL certificate (Teachers of English to Other Languages). Unfortunately things did not work out there as my teacher did not see a potential in me to be a good English teacher so I finished at that school with a general Bible certificate. Thankfully God sees us differently than people do! After my time trying to achieve my second educational goal I prayed and asked God what He wanted me to do with my life next. In January 2002, God led me to go to Gateway Training Centre for people interested in serving on the mission field. Going to this school it was a major step for me because Gateway is in Langley, British Columbia so I not only went to another school but I flew across the country for 7 months for their intensive program. However it was one of the best experiences in my life! 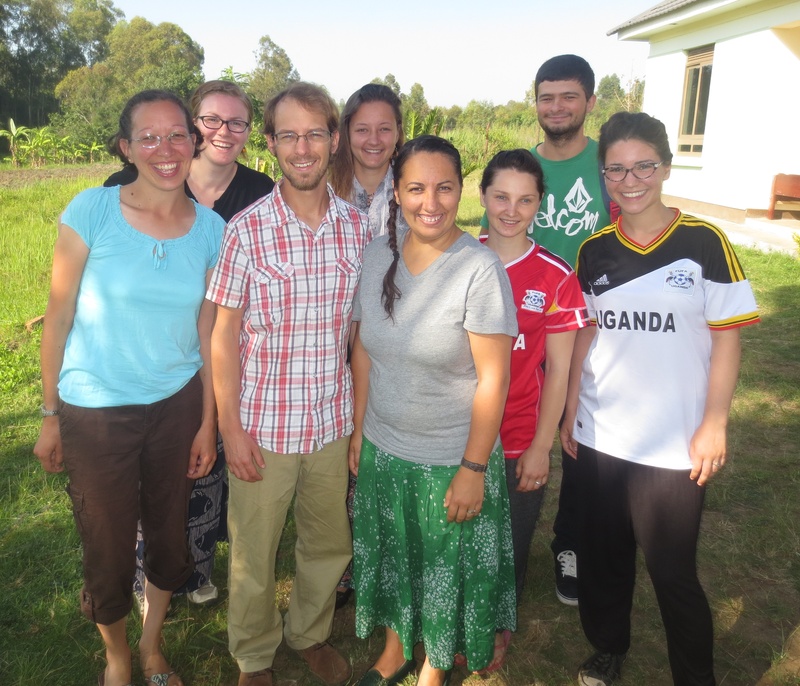 We lived in community setting, learned and grew together for the first four months of the program as we ate together, had chapel, classes and weekend outreaches. For my internship placement I wanted to return to Romania but at the time the doors were not open for me to go back yet. God opened up another door and gave me a wonderful opportunity to go to Russia in St. Petersburg for 2 ½ months where I worked alongside missionaries and reached out to street children there. I feel so blessed to have this wonderful first time experience away from home where I grew a lot and I was mentored along the way! 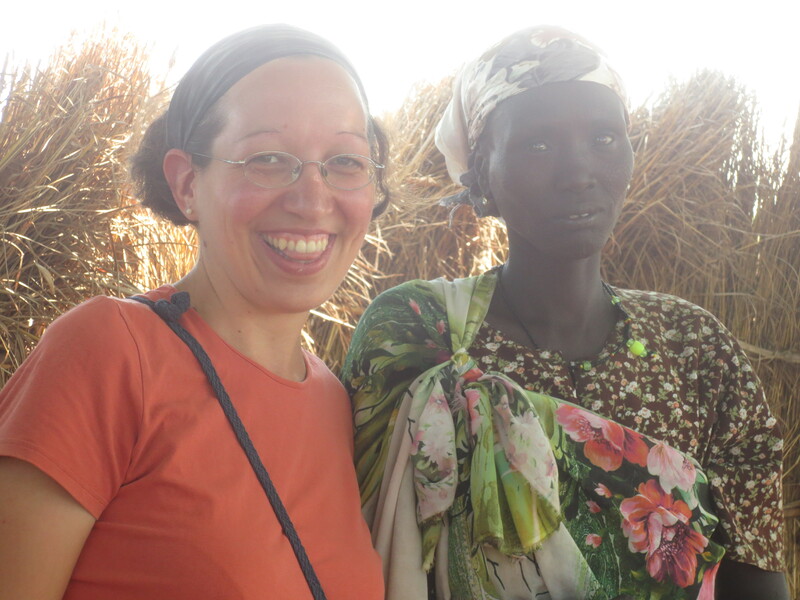 After I completed my missionary training program at Gateway God led me to return to college to complete my TESOL studies. In the fall of 2002, God led me to go to Providence College in Otterburne which is a small town in Manitoba. I had some fear going back to study my TESOL certificate but God blessed me with an amazing and inspiring teacher. I will never forget my professor Cathy. She believed in me and saw so much potential in me that I will not only be a good English teacher but a great one! When I told her what happened at Tyndale College when I tried to get my TESOL the first time she was shocked that a teacher would say something like that to their student. I am so grateful of how supportive she was to me as I returned to my studies. I give God praise that I not only completed my TESOL certificate but I also graduated with a 3-year Bachelor of Arts degree in Intercultural Studies! I actually did not need to be there for 3 years to get my degree because I was able to get a year and a half of transfers over to that school from my previous schools I had attended. God is so good! I felt so blessed that my family and both of my grandmothers were able to fly back with me for my graduation in May 2004. During my first summer break when I went to Providence College God brought me back to Romania for my second short-term mission’s experience. I came back in the summer of 2003 where I worked with street children in Bucharest and also orphan children in orphanages. 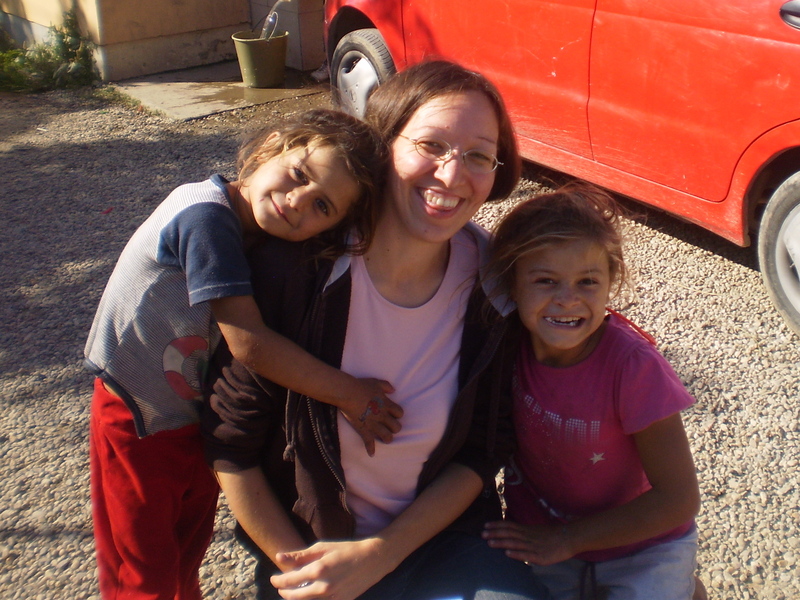 The Lord then led me back to Romania for two more short-term trips before I moved here. I went on a two week short-term trip over the Christmas holidays where I handed out the Samaritan’s Purse Christmas shoe boxes to children in orphanages, hospitals and gypsy villages. My fourth short-term missions experience in Romania was when I came here in the spring of 2005 where I worked at a girl’s orphanage in Alexandria. God taught me something on each of the mission trips that He gave me and He also gave me more of His heart for the hurting children. 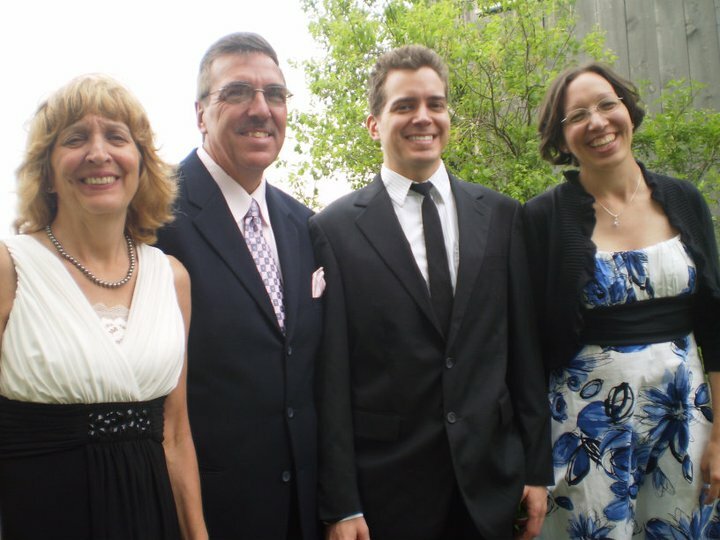 After I finished my education at Providence College I had a burning desire in my heart to return to Romania and serve God as a full-time missionary. This was God’s desire and calling on my life however the Lord told me that I was not ready yet. Instead the Lord led me to go to South Korea for one year to teach English there. At the time I fought God and I did not understand why but eventually I surrendered to His leading. God made it very clear to me that during this year it will be a time of preparation for your long-term service as a missionary in Romania. I went to South Korea from September 2005 to September 2006. It was definitely a year of stretching and growing for me! It was my first time not only to teach full-time but also to live in a foreign country that was very different from my home country. I got hired to teach English at a private school for kindergarten and for elementary children for their after school program. I enjoyed working with the children but it was a very high stressed pressure job. Unfortunately things did not work out with that school. They let me go half way in the year. Thankfully God was still completely in control and I got hired at another school run by Christians for the second half of my year! The school I worked at I taught university students and adults. 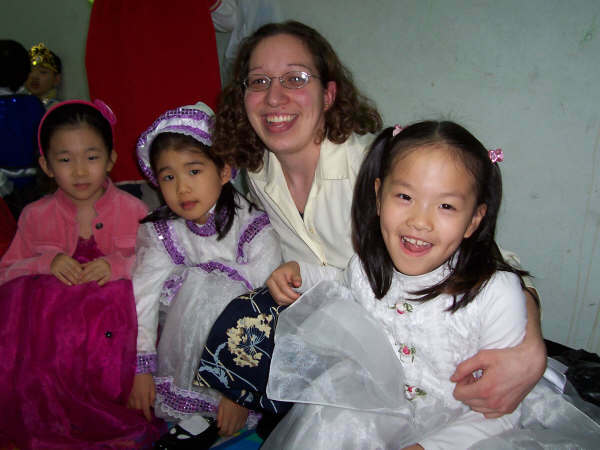 I am now grateful that God gave me teaching experiences both with children and adults while I was in Korea. I am also grateful of how God set that up because I bumped into one of my former college friends from Providence College! After I finished school there we lost touch with each other but God brought us back together while I was in Korea! After I finished my year in Korea, God spoke to me and told me that it is time for me to move to Romania. I was interested in returning with the first mission organization I went with when I first came to Romania but the doors were not open for me. Instead God led me to a different mission organization called Global Outreach where they have a missions operated English school in Târgu Mures. I felt very excited about this opportunity to not just teach English but also they encouraged their missionaries to get involved with other ministries as well. I moved to Târgu Mures, Romania in April 2007. Over the next few years I learned and grew in the vision and calling God has placed on my life. I begun teaching only adults at the school but the second term my director approached me and asked me if I would be interested in starting up children classes. I was thrilled when he asked me that and I told him I am very interested! Children classes begun to open up and during the time I taught at the school my classes increased to me working as a full-time children’s teacher. It was a real blessing for me to not only grow as an English teacher but to also work alongside Christians. We prayed together at our staff meetings, had Bible studies together and we also did social outreach events with our students to reach out to them more. As I served God as a missionary in Târgu Mures, Romania I was also involved with two other ministries outside of the English school. Every Friday afternoons I volunteered at a group home called Life and Light for 23 orphan children. I went there with the other teachers where we do Bible lessons with them, taught English or just hung out with them. Every Tuesday and Thursday afternoons I taught English at Rozmarin School where I worked with gypsy children from poor villages near Târgu Mures. These two ministries are where God continually increase His compassionate heart in my heart for the orphan and gypsy children. God also gave me some wonderful experiences with short-term teams that came to Romania as well. I had the wonderful blessing to help coordinate and lead four teams which was a very new experience for me and stretching time for me but yet I wouldn’t have traded it for the world! In May 2009, God begun to stir in my heart that He has something more for me. I decided to meet with my wonderful missionary friends Jon and Margot who were like my mentors to me while I lived in Târgu Mures. I met with them for an afternoon and shared my testimony and calling God has on my life as a missionary. When I finished sharing with them they encouraged me to pray for direction as they were sensing God is now leading me into a new ministry season. After I met with them I begun to really seek God and ask Him what He wants me to do for my life whether it is to stay with my current mission organization and continue to do what I’m doing or to do something else. As I really begun to pray and ask God want He wants me to do, God continually spoke to me that He is calling me into full-time ministry to the orphan and gypsy children and He is going to bring me into a new ministry season soon. In July 2009, I went to camp with my church in the mountains in Romania for four days before I returned to Canada for a visit. During my time at camp God did a deep work in my heart; He re-birthed the vision and calling He has on my life for the hurting children and He brought a clear confirmation to my heart that it is time to step out. I will never forget how God spoke to me so clearly and told me that He has so much more that He wants to do in and through me. The Lord even showed me a picture of an iceberg and told me that I have barely seen or touched what He has called me to do. God also spoke to me and told me not to be afraid to step into this new season of ministry that He is calling me to do. I knew when I left camp that I had an encounter with God and He alone definitely confirmed the vision He has on my life. I went to Canada for a couple of weeks to reconnect with my supporters and have a little vacation with my family. I returned to Romania at the end of August with my parents. It was my parents first time ever in Romania which was a total answer to prayer because I had been praying for them to visit Romania for the longest time! God is so good!! My parents had a wonderful time while they were here. After my parents left I told my director how the Lord is leading me into full-time ministry to reach out to the orphan and gypsy children. I told my director that I think this would be my last teaching term at the school which was a total step of faith because I didn’t have another job to go to next! During the fall of 2009, I continued to teach at the school and volunteer at Life and Light group home but also during that time I sought God for direction for the next step. During the months that I sought God for direction I also searched and applied to different mission organizations that focus on orphan and gypsy ministries. I contacted several but unfortunately I hardly heard back from hardly any of them so it felt like another testing of my faith time for me. I did have two interviews with this one organization called Buckner but after the second interview I didn’t have a peace about it. Then in November 2009 I went to a children’s conference in Sibiu where I met people who work for different organizations that focus on children at risk. The interesting thing was I got an e-mail from the director of Pathway to Joy Ministries saying that she was sorry that somehow my e-mail got over looked and she asked if I’d be interested in visiting their ministry for a week to see if it is a good fit for me. This e-mail came right before I had my second interview with Buckner and right before this conference. I replied to her and told her I am interested but then I didn’t hear back from her. My parents encouraged me to go to this conference and not to close any doors so I went. At the conference I met two of the full-time workers that work for Pathway to Joy Ministries! I told them I received an e-mail from the director but I didn’t get a reply. They told me she had been sick and just to send her another e-mail so I did and shortly after that I got a reply back! I decided to check out Pathway to Joy Ministries after the school term finished at the English school. I went to Oradea, Romania where the ministry is located for a week in the second week of December 2009 to see for myself if the ministry is a good fit for me in what God has called me to do. During my week there God gave me a real sense of peace and direction that this is where He is leading me to serve Him next. I was able to meet all of the staff and see all of the different ministries they do. I went to the hospital where they work with abandon babies, I went to the orphan mentoring clubs where they work with 90 children from a local orphanage and I also went to the Sabolciu gypsy village to see the children’s ministry they do there. The only ministry I didn’t have time for was to see the foster families they work with but everything else I pretty much got a good grasp of the different ministries. 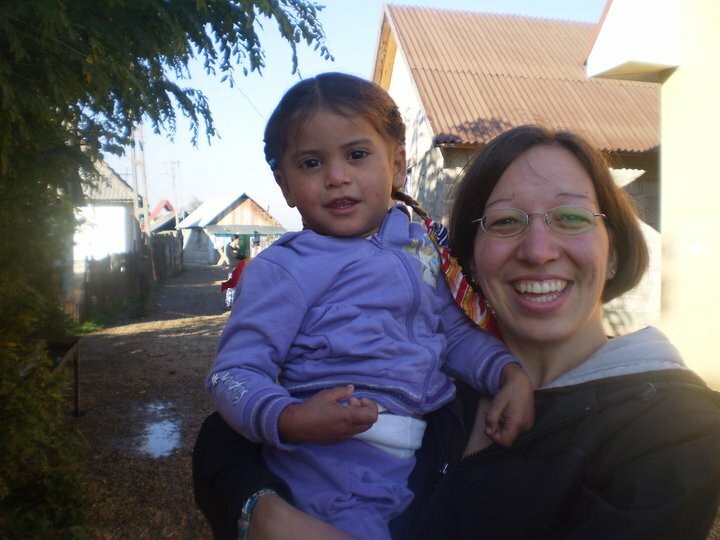 I especially fell in love with the children in the Sabolciu gypsy village and I knew right away that I wanted to work full-time with the children there! At the end of the week I met with the director for an hour. I shared with her more of the vision and calling God has placed on my life and also how He has been leading me over the years. I expressed to her that I felt a clear sense of peace and direction that God is leading me to serve with them. which was the longest time I had been home in Canada in 3 years! During my time in Canada I was able to have a time of rest, spend time with my family and friends but also to focus on sharing the vision God was leading me to do next with my supporters and anyone else who would be interested in hearing. Going home I knew I had to increase my financial support by at least $250 per month because I now have to pay for my own rent and bills whereas before the English school did that but now I’m on 100% faith support. God surprised me over and over again with how many people were interested in hearing my story and the passion that He has placed on my heart for the hurting children in Romania. My heart is filled with so much encouragement and gratitude of how many people took interest in what I’m doing and how they want to be a part of it. I am very grateful of the amazing support group God has surrounded me with as I serve Him in Romania! God has also shown me over and over again to trust in Him because He alone is our provider and He will take care of our needs! I moved to Oradea, Romania in March 23, 2010. When I look back today it has truly been a life journey of faith and trust in God in the vision and calling that He has placed on my life. Currently I work full-time with the children at the Sabolciu gypsy village. There are 56 precious children there who are all beautiful and wonderfully created by God. I teach English there and help out with any other on-going ministry needs. I also work part-time with the children at CP2 (Children’s Placement 2) which is the local orphanage that Pathway to Joy has an orphan mentoring project there. I went to summer camp with them and now I’m currently mentoring one of the girls there. I continue to study Romanian and I am also very involved with my church as well. I absolutely love what I do here and I wouldn’t trade it for the world! I honestly never dreamed that I would be working full-time in a gypsy village but God knew! Currently we are fundraising to finish the educational centre that we started to build in the village. This centre will provide classrooms, a medical room, a kitchen and even showers. We believe that this educational centre will bring hope and help break the cycle of poverty for their future families! One of the biggest achievements has been the sending of two boys to high school as the first people ever to attend from the village! 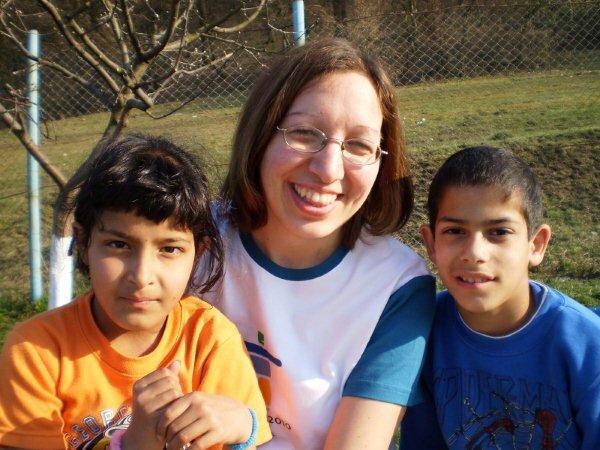 We would really appreciate your prayers as we reach out to the orphan and gypsy children here in Romania. I am with Eliza and Elena (two precious children from Sabolciu gypsy village)! 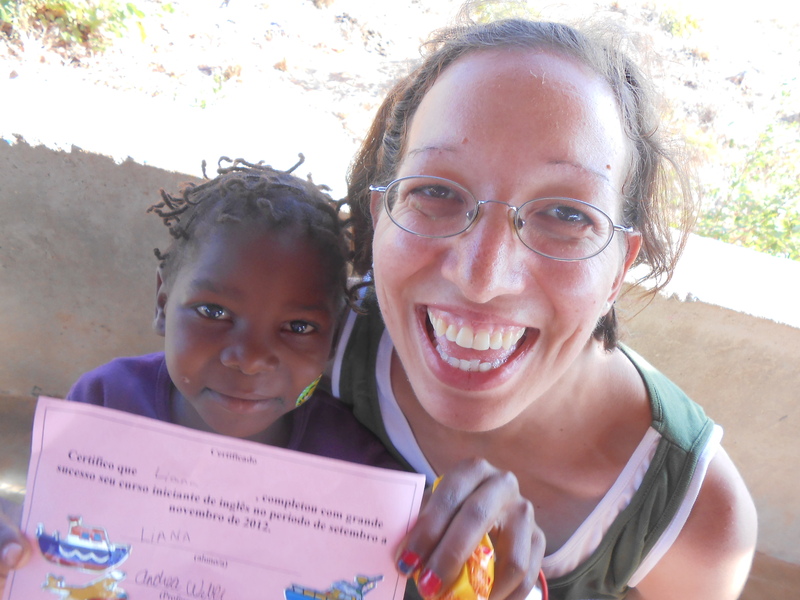 In the fall of 2012, I sent me to Pemba, Mozambique to attend the Harvest Mission School with Iris Ministries which was an amazing life changing experience for me. It was 10 weeks of intensive training along with around 300 international students from around the world who are in love with Jesus. It was a time where God set me free from the orphan spirit and He spoke to me that I am His daughter and it was also a time where I grew in the prophetic for the very first time as well. God gave me a new heart for evangelism there as we had a “bush bush” weekend which was an incredible time to share the gospel to people who are longing for hope in their lives! I could go on and on about my experiences there but it was definitely a life changing time for me that I grew in the Lord so much! After my time in Mozambique God had brought a close on my season in Oradea with Pathway to Joy Ministries which was bitter sweet because I had really fallen in love with the children and families at the Sabolciu gypsy village but yet at the same time I knew that God was opening up another chapter in my life. 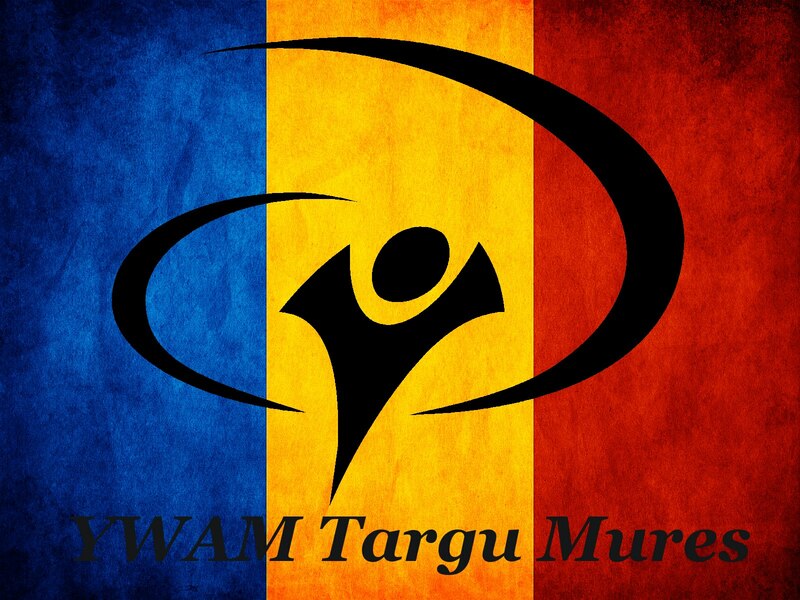 At the end of February 2013, God led me to join YWAM and then the following month on March 19th I received my acceptance to serve at the YWAM base in Targu Mures. I’m really excited about this new chapter and this new season that God has opened up for me to serve with Youth with a Mission! On May 13, 2013 I moved back to Targu Mures, Romania and joined YWAM as a full-time volunteer at the base. During the spring and summer months I began to learn the “ropes” at the base and everything I could as I quickly jumped into full-time serving with the short-term DTS teams, hospitality and whatever else I could do to serve at the base. On September 24th I made a switch from being a full-time volunteer staff to being a full-time DTS student. I was a part of a small class of five other students (two Hungarian guys, one Swiss guy, one American guy, one Ukraine girl and myself). My DTS lecture phase class. The lecture phase of the DTS (Discipleship Training School) ran until December 13th which was such an incredible time of learning again at Jesus feet. We had such amazing teachers that came and taught us on: Father of God, Holy Spirit, Missions and Evangelism, Personality and Gifts, Relationships, Spiritual Warfare, Hearing God’s Voice, Worship, Biblical Christian Worldview, Identity in Christ and The Cross. We had some really amazing times of prayer and worship in the mornings, we even did a 24 hour prayer time once during the lecture phase. Every student had a one-on-one mentor that we met with once a week which was such a blessing to grow and reflect more on what we learned with a mentor. We also did weekly outreaches once a week at different places. We ministered to different gypsy communities, to the homeless, we did a prayer walk, etc. It was definitely a time in my life where I grew more in the Lord and I’m so very thankful for this! Unfortunately something had happened to my health especially with my left knee where I had experienced pain to the degree that it forced me to stay behind and I could not go with my class on the outreach which was very disappointing. I ended up having surgery on January 7, 2015 which was something that I definitely did not expect at all. Then I had to go through an intensive physical therapy for a couple of months to get my muscle strength back up. Wow, I can definitely say I had felt like I was being put through the “fire” with this test and trial right after my DTS lecture phase! I did my lecture phase with because of my unexpected knee surgery but I am so very grateful of how God had turned everything around for His glory! With much joy in my heart I had received news on March 24th of my official acceptance to be a part of the team going to Uganda with the YWAM base from Cluj, Romania!! Wow, I felt so blown away and a bit overwhelmed with this amazing opportunity that God had opened up for me and I never dreamed of going back to Africa! I was a part of a small team of eight people (three of them were staff and five of us were students) and we had five different nationalities within our team (Romanian, Swiss, Finnish, American and Canadian). We flew to Uganda on April 22nd and we came back to Romania on May 27th. 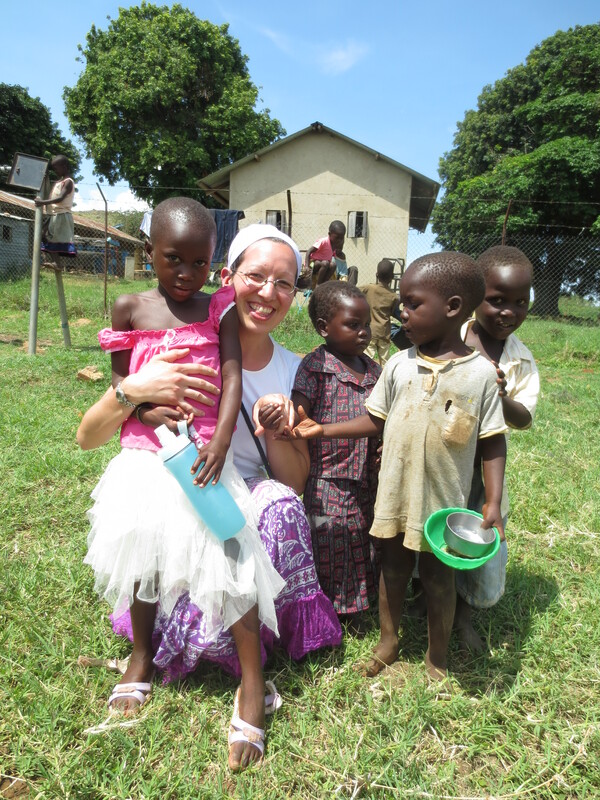 We were at two different YWAM base locations during our time in Uganda: the Buvuma Islands and Arua. We did lots of evangelism, ministry with churches, loved on precious children wherever we went, shared Jesus with people in different villages, we went to a Compassion International project to minister to children and we shared the gospel and prayed for the sick at a refugee camp with the Sudanese people. God healed this woman’s eyes! that people had for God to hear the gospel, to receive prayer and their simple faith to receive healing which was such an inspiration to me and it also encouraged me a lot to step out more to minister to people as well! This was my first outreach that I can honestly say that I felt especially stretched so much of my comfort zone to speak at different places to not only share my testimony but also to even preach and teach for the first time. The Lord really stirred in my heart many times to share about His Father’s Heart so that became a huge part of the message that I spoke to people and to the church. I just want to praise God of how He sovereignty brings the destiny that He has on our lives come to pass! I really want to encourage you that no matter what obstacle you may encounter, distraction, huddle, interruption or trial that the enemy may try and bring into your life that God our Abba Father is so very faithful and nothing can stop the plan that the Lord has on our lives! This was definitely a lesson that God had taught me throughout my DTS journey especially with my outreach. 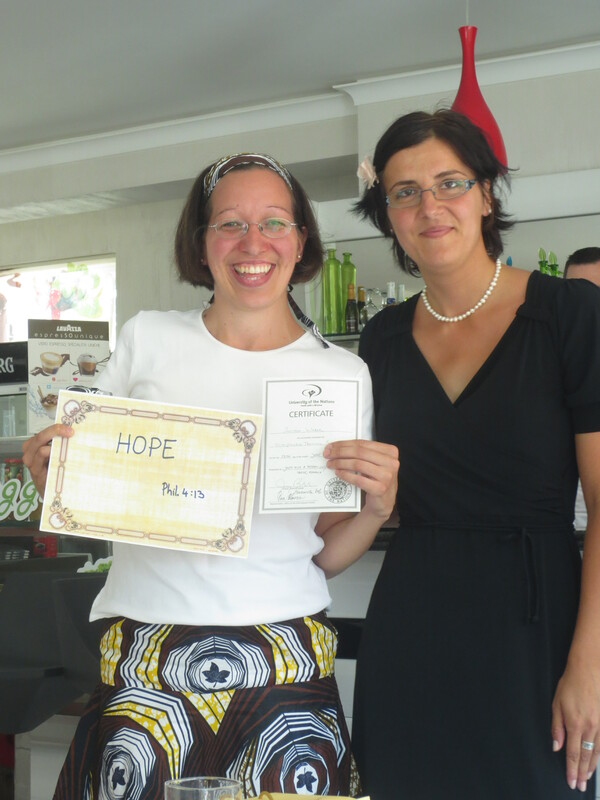 It was such a joyous moment for me when I had received my DTS certificate on my graduation day on Friday June 13th along with seven other students from the YWAM base in Cluj, Romania! After I completed my DTS and graduated I returned to Targu Mures where I am currently living again with my cat Minnie and serving now as a full-time YWAM staff at the base here. I will help with the short-term teams that come to the base, I will help staff future Discipleship Training Schools, minister to the Roma gypsy communities and whatever other doors of opportunities that God will open up in the future for me to do. I would really appreciate your prayers as I am in this season of transition and settling into this new staff position at the YWAM base in Targu Mures, Romania. I also feel a strong stirring in my heart that God is calling me more and more to the nations and Romania will become more of my “home base” missionary country so I’m really excited to see what the Lord is going to do in the future! Yes, I just want to give God all of the praise because He is so very good!! I just rejoice because He is such a faithful God and He is also such a good Daddy too! Now I’m just waiting and anticipating with so much faith in my heart that God is just going to continue to do greater and greater things in the future! The possibilities are really endless of what God will do because there are no limits with God! We truly do serve and have such a great and mighty God! I would like to say thank-you from the bottom of my heart for all of your prayers and support. It means so much to me and my heart is filled with so much gratitude of how you have been standing with me in what the Lord has called me to do so thank-you so much! I would also like to say thank-you for taking the time to check out my blog and reading about my missionary journey. It means a lot to me and I would love for you to continue to check out my blog whenever you have time to see how you can be praying for me in the future of how God is working in and through my life. May God bless you to the overflowing with His love, peace and much joy! If you would like to partner with me financially in any way here is the information below. Yes, God is so very faithful! I’m so very thankful of how He has been leading me all of these years and I’m really excited to see what God is going to do in the future!